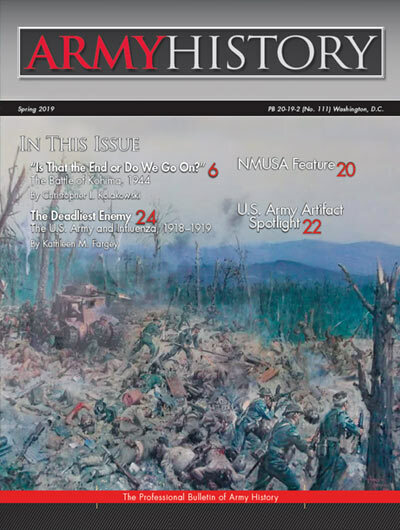 In the Spring 2019 issue of Army History, we are pleased to offer two engaging articles, the story of an interesting artifact, a glimpse at part of an exhibit under construction at the National Museum of the United States Army (NMUSA), a quality group of book reviews, and a few words from our executive director. In the first article, author Christopher Kolakowski details the harrowing story of the Japanese attack on British troops in India at Kohima. Recognized as one of the greatest battles in British military history, the determined and desperate stand by the small garrison is the stuff of legend. Painting a graphic portrait of the savage fighting, Kolakowski details the siege and the relief efforts, as the beleaguered British force fights to hang on in the face of the Japanese onslaught. The next article, by Center of Military History (CMH) historian Kathleen Fargey, examines a sampling of the Army’s response to the influenza outbreak of 1918–1919. Looking at five locations, or case studies, in the United States and France, Fargey documents the Army’s attempts to respond to, treat, and mitigate the effects of a disease that would take more U.S. soldiers’ lives than had been lost on the actual battlefields of the First World War. The Army found itself wholly unprepared for the sheer volume of patients that would pass through its hospitals. Attempts to cope would strain the Army’s medical system to the breaking point, but the lessons learned from the pandemic informed plans for response that the Army utilizes to this day. Our NMUSA feature shows a part of museum exhibit construction that few ever get to see, as actual artifacts are incorporated into a realistic battlefield scene that visitors will one day soon be able to walk through. The Artifact Spotlight highlights a World War I helmet and includes the personal story of the soldier who brought the item home. Opening and closing this edition, the CMH director discusses an issue of critical importance to the Army historical community as the Center looks forward to its transition into a component of the Army’s Training and Doctrine Command. I continue to invite your constructive comments on this publication as we strive to continue to bring our readers engaging and enlightening content. "Is That the End or Do We Go On?" The complete collection of Army History Magazine. Book reviews are part of CMH's professional quarterly bulletin, Army History. We invite you to self-nominate to submit a review of a book from among those listed here.